This is possibly the tastiest muffin I've ever had. Including all of the gluten-ful ones I had before being diagnosed. 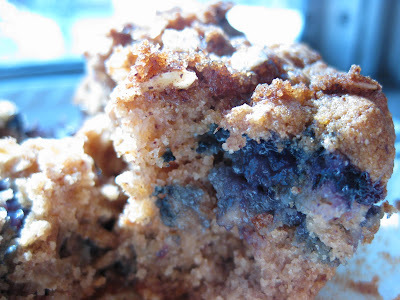 If you like hearty oats, delicious cinnamon and brown sugar, and blueberries, prepare to be blown away by these little treats. I have been wanting to try the recipe (which you can find by clicking here) from Karina (the Gluten-free Goddess) for a while now. Well, this morning, I went to the farmer's market and found an unbelievable deal on blueberries - 16 oz. packages for only $2.49 each. So I came right home, opened Mozilla to Karina's blog, and set to work mixing sorghum, cinnamon, brown sugar, oats, and fresh, ripe blueberries. Tempted as I usually am to eat a baked treat hot from the oven, I couldn't quite do it with these because they needed to cool for a little while to firm up. They were slightly fragile when I removed them from the pan, but they were solid enough by the time I had one. I still wouldn't necessarily expect to be able to grab one and eat it on the go, but that was fine by me! (**Note: if you refrigerate them, they hold up pretty well, and you would probably wouldn't need a plate.) You could try them with other berries, too - I'm guessing that raspberries, cherries, or apples would be delightful as well. 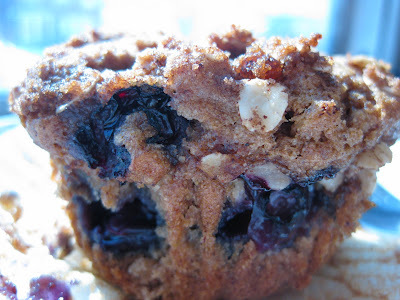 These muffins have a wonderfully comforting combination of flavors, and I am constantly amazed by what alternatives to wheat and animal products can produce - a gluten-free, vegan muffin that tastes at least as delicious as anything you've had that contains gluten. I promise.